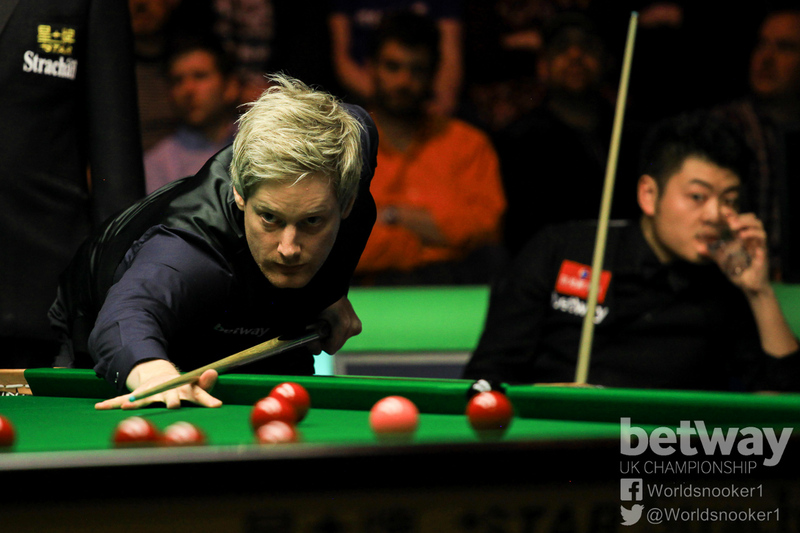 Neil Robertson beat Liang Wenbo 10-5 to win the Betway UK Championship, and made the first ever 147 in a Triple Crown final. Australia’s Robertson won his second UK title to become the eighth player in snooker history to lift the trophy more than once. The first UK final between two non-British players was highlighted by a sensational 147 from Robertson in the sixth frame. Never before had a UK, World Championship or Masters final featured a maximum break. Robertson landed the first prize of £150,000 plus a £44,000 bonus for the 147, bringing his earnings for the past four weeks to £294,000 having also won the Champion of Champions in Coventry. Prior to this golden spell, the 33-year-old left-hander had endued a barren period of 17 months since winning his previous ranking title at the 2014 Wuxi Classic. But he is clearly now back to his best as his powerful high-scoring, shrewd tactical game and ability to pot key balls at crucial moments made him the outstanding player in York over the past fortnight. The world number three has now won 11 ranking titles, moving him level with Ding Junhui in sixth place on the all-time list. Liang missed out on his first ranking title, having lost his only previous final at the 2009 Shanghai Masters. But this was clearly the best week of his snooker career so far and his best run in a BBC-televised event. The charismatic Chinese cueman finished with a cheque for £70,000, his biggest pay-day, out-stripping his earnings for a World Cup triumph alongside Ding in 2011 and an Asian Tour title in 2013. Liang, age 29, also makes a huge jump to 15th in the rankings which earns him a place in the Masters. 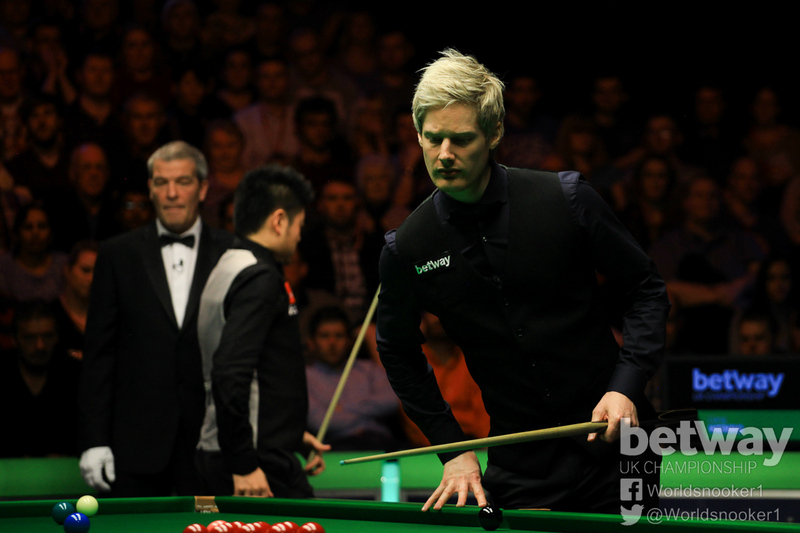 He’ll make his debut in the invitation event against John Higgins in London next month. 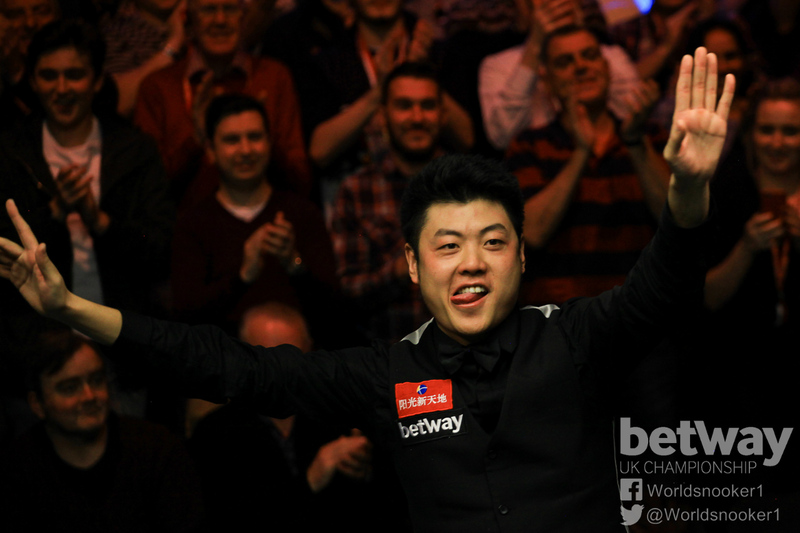 Liang trailed 5-3 after the first session then made a strong start tonight with a break of 82 to halve the deficit. He was first among the balls in frame ten but broke down on 47 and Robertson made a brilliant 78 clearance which he later described as his best break of the tournament. He added a scrappy 11th to lead 7-4. A run of 78 from Liang reduced the gap at the interval, but in frame 13 he failed on a red to a top corner when leading 35-5, which proved a vital miss. Robertson made 56 before running out of position, but later took the frame after Liang had gone in-off the final yellow. Liang also had chances in the 14th but missed the pink to a baulk corner with one red left at 55-25, and again Robertson punished him with a fine clearance to go 9-5 up. In the 15th, Robertson made 42 before missing the green, but Liang’s counter ended at 9 when he rattled the black in the jaws of a top corner, and that proved his final shot as a further 20 from Robertson took him over the line. A record 104 centuries were made during the tournament, including nine from Robertson and eight from Liang. 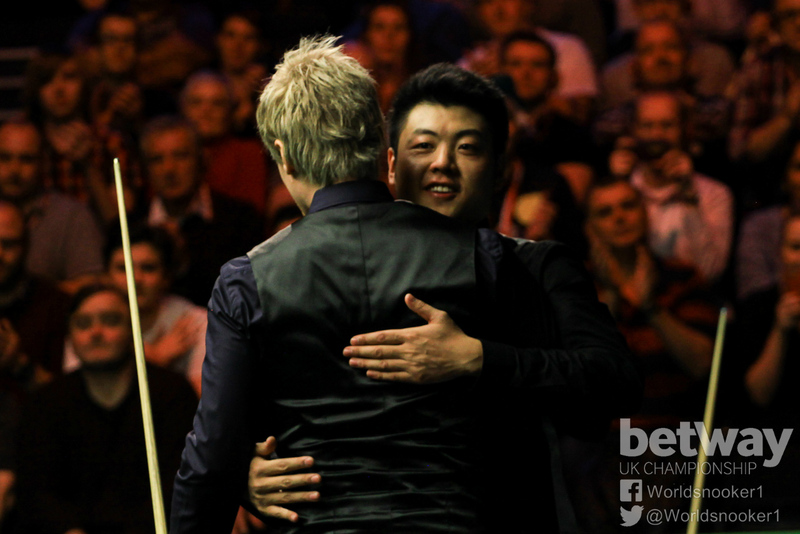 “Liang played his part in a really good final,” said Robertson, who received encouraging text messages from Chelsea captain John Terry before the final and again after the 147. “I don’t think you’ll ever see as high a standard from both players in the first session, usually there’s one player who does very well and the other struggles, but we both went blow for blow. “He kept coming back and I wondered when he was going to start missing. When I got to 8-5 I think he started to feel it a little bit. Tonight was about getting the job done and I won a couple of crucial frames to do that. 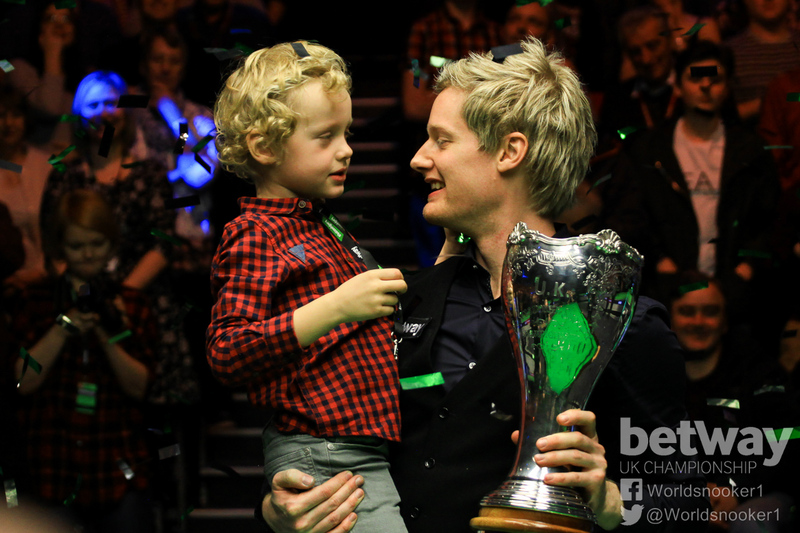 Reflecting on the 147, he added: “As a kid you always want to make one on the BBC, especially in a final. To do it under such pressure was an incredible feeling, the crowd were absolutely amazing. It was probably on par with when I got my 100th century in a season at the Crucible 18 months ago. The pressure of the century of centuries was building up for months but the pressure of the crowd today was very similar. I’m fortunate to have done both. Liang was supported in the arena by wife Chen Xue Jiao and son Liang Chen, who flew from China’s Heilongjiang province to the UK this morning.